Collage and Assemblage artist Robert Rauschenberg responded to the rise of mass-media culture during the 1950s and 1960s, by, as he famously declared, “working in the gap between art and life.” He did this by actually making mass media his artistic medium. Rauschenberg clipped and appropriated newspaper, magazine, and television images to create a new kind of realism, one that used everyday pictures—which were often discarded almost as soon as they were made—to capture life’s immediacy. Rauschenberg was socially and civically minded. His four-portfolio project Currents (1970) demonstrates how the artist used mass media to draw attention to social, political and financial anxieties of the moment. Robert Rauschenberg, Making History presents eight screenprints from MAG’s permanent collection selected from two portfolios of the Currents project: Features and Surface Series. 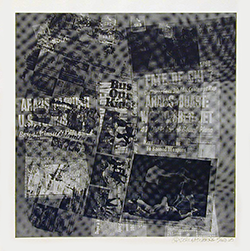 Images and headlines referring to the Vietnam War, demonstrations and protests, Richard Nixon and other political figures, sporting events, advertising, and consumerism, all find their way into Rauschenberg’s compositions, leaving viewers with an aestheticized time capsule reflecting one man’s perspective of society during a significant, charged, and transformative moment in history. Above: Surface Series #53 (from Currents), 1970. This exhibition is sponsored by the Emily Sibley Watson, Claude Monet, and Georgia O’Keeffe societies. Works of art: Gift of Joan and Martin Messinger.